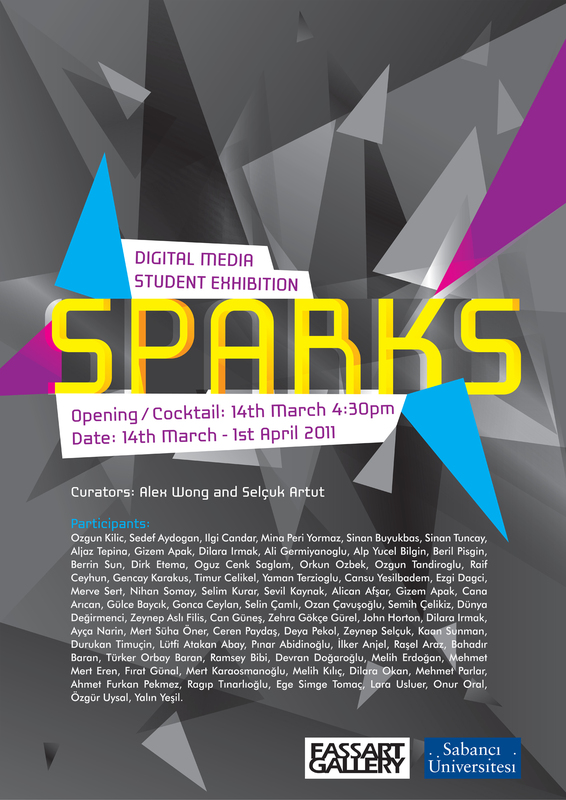 SPARKS is an attempt to examine the visual impulses and discoveries of experimental storytelling based on individual artist experience and visual awareness. The aim of this exhibit is not only to showcase complete final artwork, but to share the student ignited sparks of ideas, conceptual developments, processes, to expression of finalizing an artwork through digital media application. Istanbul is the largest city in Turkey and is among the 25 largest urban areas in the world. History of Istanbul (Constantinople) can be traced back since the Byzantium period, The Roman Empire, The Byzantine Empire (Easterm Roman), The Latin Empire, The Ottoman Empire till the Republic of Turkey. Istanbul today is not only offering layers of history and cultural herritage but also a metropolitan with upbeat social and political ideology, exuberant lifestyle, modern and floushing contemporary art and design. The selected artworks demonstrate sparks of individual visual perception, blending the students’s critical responses to historical and cultural changes. The show also reflects the journey of immersed multi-perspective approach to knowledge acquisition. The use of digital media is ubiquitous with contemporary life and therefore a very important 'material' for emerging artists to consider. 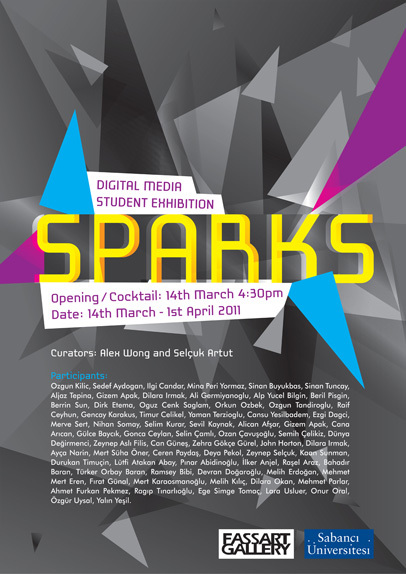 SPARKS explore the bridging languages to other disciplinary domains – communicating and coming to understand multiple approaches to contemporary creative technological practices. At Sabancı University we provide a diverse learning environment for interdisciplinary and transdisciplinary exploration in the digital arts; to educate talented and intellectually engaged individuals from diverse cultural backgrounds; to provide an expansive pedagogical set of options to enable individuals to investigate innovative approaches to contemporary theory and practice; to facilitate exploration of the broad potentials of digital media as a ubiquitous tool across multiple domains; to foster individual inquiry, high level collaboration and team-based media production; and to graduate articulate individuals – SPARKS help student trigger to greater exposures of talents and creative thinkers who might become leaders in the field over the years ahead. We hope to share the SPARKS to local and international audiences, academy and higher educational alliance to forge greater fusion in knowledge sharing and partnership in exchange activities. Curated by Yoong Wah Alex Wong and Selçuk Artut. Ozgun Kilic, Sedef Aydogan, Ilgi Candar, Mina Peri Yormaz, Sinan Buyukbas, Sinan Tuncay, Aljaz Tepina, Gizem Apak, Dilara Irmak, Ali Germiyanoglu, Alp Yucel Bilgin, Beril Pisgin, Berrin Sun, Dirk Etema, Oguz Cenk Saglam, Orkun Ozbek, Ozgun Tandiroglu, Raif Ceyhun, Gencay Karakus, Timur Celikel, Yaman Terzioglu, Cansu Yesilbadem, Ezgi Dagci, Merve Sert, Nihan Somay, Selim Kurar, Sevil Kaynak, Alican Afşar, Gizem Apak, Cana Arıcan, Gülce Baycık, Gonca Ceylan, Selin Çamlı, Ozan Çavuşoğlu, Semih Çelikiz, Dünya Değirmenci, Zeynep Aslı Filis, Can Güneş, Zehra Gökçe Gürel, John Horton, Dilara Irmak, Ayça Narin, Mert Süha Öner, Ceren Paydaş, Deya Pekol, Zeynep Selçuk, Kaan Sunman, Durukan Timuçin, Lütfi Atakan Abay, Pınar Abidinoğlu, İlker Anjel, Raşel Araz, Bahadır Baran, Türker Orbay Baran, Ramsey Bibi, Devran Doğaroğlu, Melih Erdoğan, Mehmet Mert Eren, Fırat Günal, Mert Karaosmanoğlu, Melih Kılıç, Dilara Okan, Mehmet Parlar, Ahmet Furkan Pekmez, Ragıp Tınarlıoğlu, Ege Simge Tomaç, Lara Usluer, Onur Oral, Özgür Uysal, Yalın Yeşil.